Your selection of packaging is important on many levels but most importantly it adds value to your merchandise and gives an experience to your customers. You want every transaction to be special and memorable so people will return to your business again and again. In person interaction ends when you hand the shopper their purchases, therefore presentation is important. Whether you are serving customers in a retail setting, hosting trade show traffic or selling your items at a craft fair or outdoor market you most likely need to provide a bag for your customers. Paper bags are a wonderful ecological option as they are durable, recyclable and most often American made. As the discussion in many areas continues on waste control and environmental concerns paper bags are seen by many as the responsible choice for our planet. Fortunately, there are many options in paper bags from economical SOS and merchandise bags without handles, to high end Euro Totes that can have every aspect of themselves customized from the ribbon handles to the gusset printing. Whether its Paper Shopping Bags, Euro Totes, Merchandise bags or SOS bags, we have them all in different paper materials, handle styles, coatings, sizes, and colors. The most commonly used paper bag is the Twisted handle Shopping Bag. These come in a variety sizes, colors and are also available in pre-printed designs to meet your aesthetic or holiday needs. Custom printing on these paper bags is advertising money well spent as shoppers carry them around town. The smallest size paper bag, a Gem sized bag is 5.5"x3.25"x8.33" and is perfect for fashion jewelry, trinkets and candy purchases. The most popular two sizes in the paper shoppers are the Cub and Vogue size. Most businesses that are customizing their bags chose these two sizes. A Cub sized paper bag at 8"x4.75"x10.5" is perfect for t-shirts, scarves or small glassware. The Vogue sized paper bag is 16x6x13 and is the iconic bag design for clothing stores and fashion related businesses. If you have large items like pillows or outerwear the Jumbo bag 24"x7"x18" is a perfect choice. As you look for the right sized paper shopping bag you will notice that there is a rainbow of colors available. We have everything from natural & organic looking brown kraft, clean crisp white as well as a wide range of other colors. Some business owners opt for metallic colors. We even offer pre-printed patterns like western, animal, jungle and much more. These elegant and sophisticated paper bags were initially used overseas in the fashion districts of Italy and France. American Retail Supply offers a wide variety of Euro Totes including laminated, gloss, matte and customized options that scream high end luxury. One recent addition to this line of packaging is the Purse Tote which is a one-step way to package jewelry or small items. The unique look of the Purse Tote is further elevated by the high-end matching ribbon that closes and essentially wraps the items in one step. Another wonderful option is the Tinted Euro Tote. 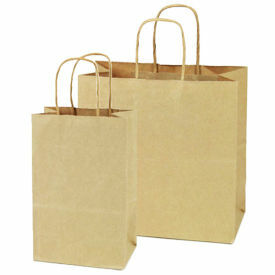 You will find the thickness of the paper coupled with its soft buttery feel really add to rich look of these paper bags. Square Open Sacks (SOS) are a Merchandise Bag with a gusset or side panels that allow for more merchandise to be placed in the bag while also allowing the bag to stand on its own when opened. The SOS bags are most commonly used by pharmacies and larger models are popular with grocery stores using paper bags. This style of paper bags is economical, easy to store and good for general everyday use by farmers markets, grocers, and many other businesses. You donâ€™t need to sacrifice style if you want to use a flat bag either, these are available in a variety of colors and can be imprinted to give them a personal look. What if you need a wax lined bag? We have Glassine Lined options that are FDA approved for food safety, so you can feel good providing these as a wrap for baked goods or dog treats.